As the title may suggest, this is a composition that includes dance music, and in it I combine two very contrasting dances into a single movement. I chose dances that were representative of my wife's and my mixed ethnic backgrounds. Some of her roots go back to Ireland, and she is represented by a reel, a quick dance in duple time. I am part Polish, and I chose to represent myself with the Polonaise, a stately dance in triple time. As a pianist, I identify closely with the polonaise, having played many of Chopin's polonaises as I grew up. Stated first is the polonaise, built from fragments that coalesce from a mysterious opening. 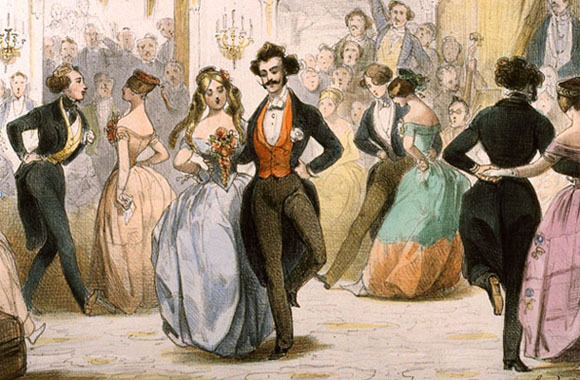 A drum beats in the distance, and rather suddenly the dream-like state is interrupted by a somewhat spastic polonaise. After it falls apart, a long drawn-out acceleration leads to the reel. Featuring the fiddle (naturally), the reel continues to accelerate until it reaches a critical speed, at which point it is joined by the polonaise in a boisterous and energetic conclusion. There is also a version for clarinet, violin, cello, and piano that was written for Music from Copland House for the inaugural CULTIVATE emerging composers institute. I am self-published. Please contact me if you are interested in purchasing parts for this piece.